Abby was feeling antsy this week, itching for a new environment in which to do her investigations. This translated into a request to swap places with the accounting department, and ultimately, lead her to take a field trip where she found herself the target of a deadly band of thieves on NCIS Season 13 Episode 5. Christine: It’s safer in the basement. Kathleen: Things never go according to plan. Doug: ...And what are you carrying in your boot? Christine: The case itself was a little weak. Why did the bad guys suddenly decide to kill everyone? They seemed more like caricatures than real villains so it was hard to feel that Abby was in real danger. That said, it was great to see Abby let out of the lab…even if she did just end up in a different lab. David: I'm with Christine. This ep didn't keep me clinging to the edge of my seat, but it was a refreshing change to have an Abby-centric ep. Kathleen: The episode required a lot of suspension of disbelief (like Abby crawling through air vents [with those boots!] without every bad guy in the building hearing her), but I just thought of it like summer popcorn fun. It may not hold up under scrutiny, but it's an enjoyable romp. Here's a question: how did the bad guys get their hands on the sign-in sheet? Wasn't that in the lobby... where all the good guys are? Christine: I thought Abby asking Gibbs to sign her makeshift release form to spring her from the basement for the day was quite funny, especially if you paused on the paper to read it. Kathleen: I liked Abby saving the day with her, and then promptly turning around and asking Gibbs to arrest the doctor for being in on it. Nice! Doug: That peck on the cheek from Gibbs to Abby remains a highlight for me. He obviously sees her as a daughter, which explains so very much about their relationship and why she gets away with things. Christine: I kind of wondered why Abby could make her way through the ventilation system but could only get smoke out of the one that led outside. Also, how does she get through security with all that stuff hidden in her shoes? David: Janis Brown's character was such a milquetoast. I guess I expected her to be on par with Abby since that's usually the case when she works with visiting experts. Also, it's minor but the texting-while-driving woman in the prologue and her "Sorry, sir. I really don't know how this happened." Really? Not even the slightest idea? Kathleen: There wasn't one particular thing that I thought could have done better, except for maybe coming up with a better way for her to get back to Dr. Brown's lab than through (in reality very noisy) ventilation ducts. Seriously, they busted that on Mythbusters (RIP!). Doug: I'm beginning to sound like a broken record on this, but seeing Tony scrambling to get out of Gibbs way just put a huge speed bump in the plot for me. There's no need for that nonsense, and it reduces the overall enjoyment of the show. How strong is Abby’s non-violence ethic? Would she have taken her life (and the lives of the others in the room) in order to save the hostages? Christine: I’d be interested to see how Abby would react if it was a choice between taking a life to save someone she loved. Other than that, she was certainly willing to stretch things as far as she could without hurting anyone. Of course, she believed Gibbs would come through for her and he did. David: I don't think so. That's just not her. However Christine raises an interesting question and maybe Abby's final chat with Gibbs foreshadows an evolution in her character. Kathleen: I agree with Christine. Abby's never been in a true us-or-them situation. Not that I'd wish that on anyone, but none of us know truly how far we'd be willing to go until we find ourselves there. Doug: I hope you're right, David. I'd really like to see the writers take a step forward with Abby and force her into a situation where she has no choice but to shoot someone in order to save others. (Kind of like they did with Garcia on Criminal Minds Season 9 Episode 24, when she had to shoot someone to save Reid). It would completely upset her worldview, and it would cause an evolution in her character. Should Dr. Brown get lots of jail time for her role in the case? Christine: She should definitely get some sort of punishment. No matter what the reasons, what she did was illegal and she worked with people who were willing to kill. If they had, she’d be looking at a murder charge too. David: I agree with Christine. She's not blameless, though I don't think taking/killing hostages was her idea. Still, she masterminded the data theft and conspired with the guys in the uniforms to create a disturbance. Kathleen: Maybe I just have a different perspective than you two, but that woman deserves to go to jail for a long, long time. Yes, she deserves some consideration for changing her mind, but this was a situation that anyone with a lick of sense could know that it would not have ended well. And, frankly, she's guilty of felony murder in the death of the original victim, as it stems from a crime she started and was perpetuating. While her goal may have been good, pretty much every single thing she did along the way was bad. What's that saying about a road paved with good intentions? Doug: I'm in complete agreement with Kathleen on this. The woman actually put the whole thing in motion, and that makes her culpable in those murders. She needs to go to jail for a long time. 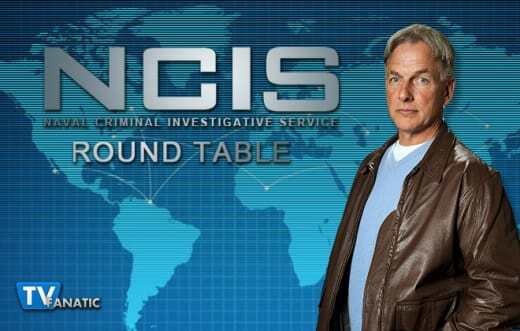 Join us next week when we break down NCIS Season 13 Episode 6!